The debate over violence in cinema isn’t anything new. Film critics and various organizations have been arguing for years both for and against the representation of violence in cinema, along with its effect on the audience. Proponents against it would argue that the exploitative nature of these scenes lead the viewer to become desensitized to the brutality that is being depicted, leading them to become more aggressive and potentially violent. The other side of the spectrum believes that it is nothing more than a spectacle of fantasy that offers the viewer a cathartic release from societal issues. 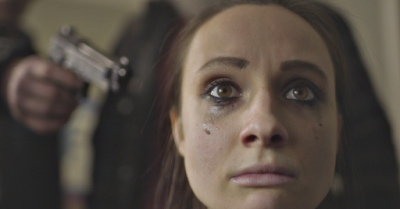 The new meta horror film Fake Blood examines these issues and what social responsibility filmmakers have for the violent imagery that they present on the screen, delivering an original and unexpected take on the meta sub-genre and mockumentaries. Rob Grant and Mike Kovac are horror filmmakers who have made very violent and overly gory horror films for several years. They receive a disturbing video from a fan, recreating a scene from one of their previous films Mon Ami. This compels them to go on an investigative journey of the responsibility of filmmakers in portraying violence in their pictures, seeking to explore the difference between movie violence and real violence. Their probe takes them down a path of real criminals and their victims, a far darker and dangerous territory than they had expected. 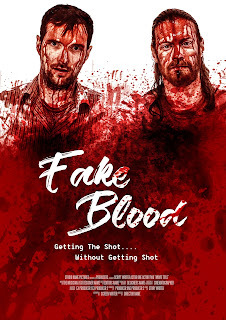 The brilliant thing about Fake Blood is that it never breaks away from pretending to be a documentary, it is completely believable the whole time. Most mockumentaries have some sort of comedic elements to them, even if it is just some form of dark comedy. Fake Blood does not do this and you truly accept that all of the events taking place are real. Fake Blood uses a combination of footage that includes low quality VHS, cell phones, clips from various horror movies and other violent film scenes, documentary style recreations, and the documentary style portion shot on digital. It is narrated by Rob Grant, who lays out the story as you might expect any filmmaker to do in the countless other documentary films you’ve seen before. The editing is crisp and spot on, especially a great opening sequence showcasing clips of intense gore in the movies that Grant and Kovac created. The score skillfully uses classical music in certain scenes to lighten up the violent imagery, while adding a thriller type score to create an element of uneasiness and tension. While there are other actors that appear in the picture, Grant and Kovac have the most onscreen time and are the primary focus of the story. They both do an excellent job and come off as being totally credible, never overacting or feeling like they are fictitious characters. They are just real people dealing with the situations that are placed in front of them. Fake Blood is not a traditional horror film, it wouldn’t even be considered a traditional found footage or meta horror film. Instead, it surprisingly defies expectations and constantly keeps you guessing on the reality of what is occurring and what will happen next.